NOAA-GLERL has been exploring the relationships between ice cover, lake thermal structure, and regional climate for over 30 years through development, maintenance, and analysis of historical model simulations and observations of ice cover, surface water temperature, and other variables. Weekly ice cover imaging products produced by the Canadian Ice Service started in 1973. 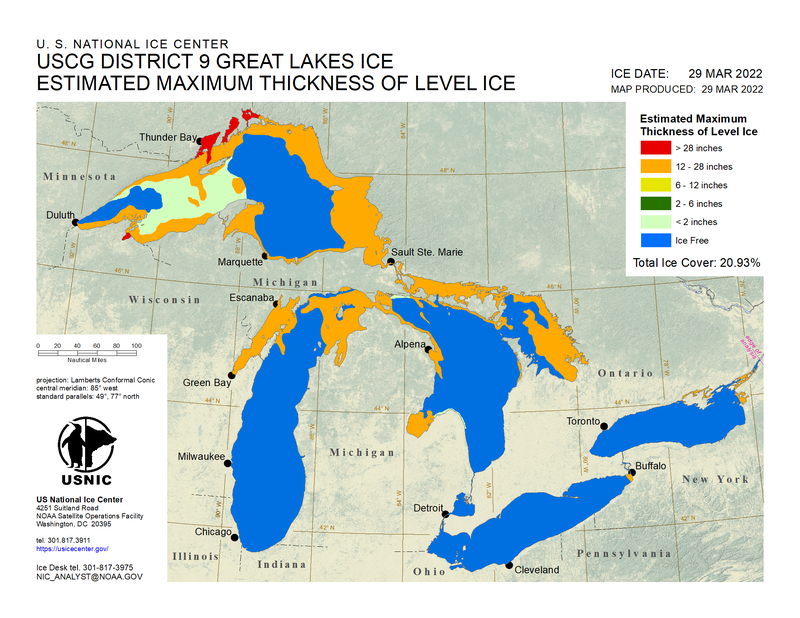 Beginning in 1989, the U.S. National Ice Center produced Great Lakes ice cover charts that combined both Canadian and U.S. agency satellite imagery. 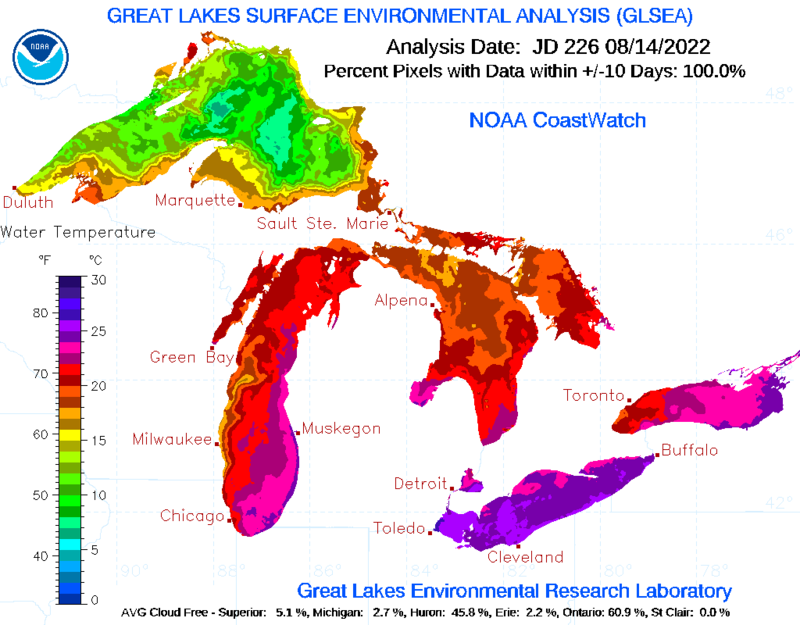 These products are downloaded at GLERL by our Coastwatch program, a nationwide NOAA program within which the GLERL functions as the Great Lakes regional node. In this capacity, GLERL obtains, produces, and delivers environmental data and products for near real-time observation of the Great Lakes to support environmental science, decision making, and supporting research. This is achieved by providing access to near real-time and retrospective satellite observations and in-situ Great Lakes data. CoastWatch is a nationwide National Oceanic and Atmospheric Administration (NOAA) program within which the Great Lakes Environmental Research Laboratory (GLERL) functions as the Great Lakes regional node. In this capacity, GLERL obtains, produces, and delivers environmental data and products for near real-time observation of the Great Lakes to support environmental science, decision making, and supporting research. This is achieved by providing access to near real-time and retrospective satellite observations and in-situ Great Lakes data. GLSEA (The Great Lakes Surface Environmental Analysis) is a digital map of the Great Lakes surface water temperature and ice cover which is produced daily at GLERL.The lake surface temperatures are derived from NOAA polar-orbiting satellite imagery. The addition of ice cover information was implemented in early 1999, using data provided by the National Ice Center (NIC). Lake surface temperatures are updated daily with information from the cloud-free portions of the previous day's satellite imagery. If no imagery is available, a smoothing algorithm is applied to the previous day's map. 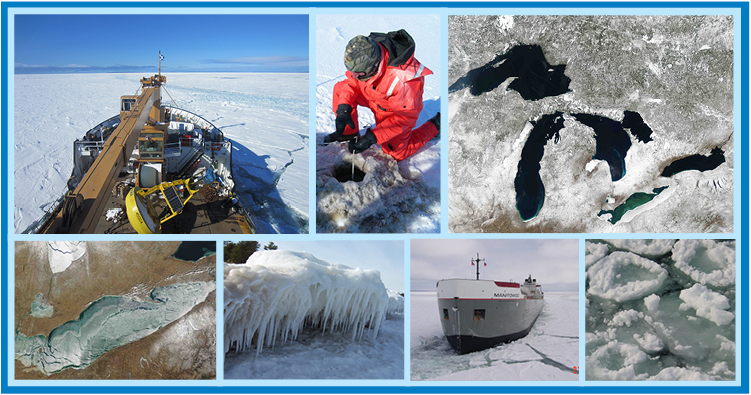 NOAA/GLERL has been monitoring and documenting Great Lakes ice cover since the early 1970's using the ice products developed by the U.S. National Ice Center and the Canadian Ice Service. Research conducted on hydrometeorological processes and regional climate trends has led to models of lake thermal structure that play an integral role in ecosystem forecasting. This database simplifies access to Great Lakes ice cover data by bringing the basic units of data together for the entire time period, 1973-present. The Great Lakes Ice Atlas summarized ice cover for the period 1973-2002, with addendums in a separate report for 2003-2005, in addition to providing a number of statistical products. Using the same methods, the original ice charts for 2006 through present were processed and added to this database. Original ice charts are provided in three forms: asci grid files, jpeg image files, and ArcGIS shapefiles. From 1973 through 1988, the source was the Canadian Ice Service. Beginning with 1989, the source was the U.S. National Ice Center, (NIC). Data from both Canadian and U.S. sources is combined in NIC's daily products. Details on file formats, naming conventions are here: asci grid metadata. Files that align ascii grid data with location and lake are here: geographic metadata. Original data files by decade. Number of observations per season varies, but for many years was twice per week. Max ice cover image shown for each year. (Click on thumbnail for larger view.) Year summary link leads to ice cover images for entire season. Links to daily interpolated grids are listed with their main reference as best source of metadata. GLERL conducts research on ice cover forecasting on two different time scales: short-term (1-5 days) and seasonal. GLERL's short-term ice forecasting is part of the Great Lakes Coastal Forecasting System, an experimental model used by the National Weather Service to predict wind, waves, currents, and more. The ice nowcast and forecast products (concentration, thickness, velocity, and vessel icing) are still experimental. GLERL's seasonal ice cover forecast is based on statistical and physical analysis. This forecast is also experimental. The Great Lakes Coastal Forecasting System (GLCFS) is a short-term physical modeling framework for predicting waves, currents, water temperature, and ice. GLCFS water temperature, air temperature, wind, and the National Ice Center daily ice cover are used to predict ice concentration (%) up to 5 days in the future. Ice forecast products under development include ice thickness, vessel icing, and ice velocity. The following links to the Great Lakes Coastal Forecasting System pages which contain visual summaries of current Great Lakes ice conditions. These links to the GLCFS Nowcast/Forecast pages include current observed ice cover, wind, and air temperature as well as model-derived ice thickness, ice velocity, vessel icing, surface currents, and water temperature. Forecast and animations for all parameters are available for up to 5 days. Note that some of these products are still under development. Research at GLERL has shown that the interannual variability of Great Lakes ice cover is heavily influenced by four large-scale climate drivers: ENSO (El Nino and Southern Oscillation) NAO (North Atlantic Oscillation) or AO (Arctic Oscillation), PDO (Pacific Decadal Oscillation) and AMO (Atlantic Multidecadal Oscillation). Based on statistical and physical analysis, regression models are developed linking climate indices (ENSO,NAO, PDO, and AMO) and annual maximum ice coverage for each of the Great Lakes as well as for the basin. Using these projected indices, a seasonal forecast for Great Lakes ice cover can be made. This is an area of active research at GLERL. What is the current state of ice cover for the Great Lakes Basin? How do this year's water temperatures compare with previous years? When was ice cover the highest (or lowest) for each of the Great Lakes? What does the long-term average look like for maximum ice cover? Great Lakes ice cover experiences a LOT of year-to-year variability. This image below illustrates the long-term mean in annual maximum ice cover for 1973-2017. Why does Lake Ontario generally have the least ice cover of all the Great Lakes? Lake Ontario's extreme depth (86 m average; 244 m maximum) translates to tremendous heat storage capacity. It also has a smaller surface area for heat loss. In addition, cold air outbreaks from the northwest and west are moderated by the waters of Lakes Superior, Michigan, and Huron. These factors combine to keep ice cover on Lake Ontario at a relatively low level most years. When does ice cover peak on the Great Lakes? Maximum ice cover on the lower lakes (like Lake Erie) normally occurs between mid-February and end of February. Maximum ice cover on the upper lakes (like Lake Superior) normally occurs between end of February and early March. Does more ice cover reduce evaporation and lead to higher water levels? The relationship between ice cover, evaporation, and water levels is complex. Data on modeled evaporation shows that this process peaks in the fall, before ice cover formation. In a severe ice cover year such as 2014, the thermal structure of the lake could be impacted for the rest of the year, potentially reducing evaporation from the lakes next fall. Evaporation and precipitation are the major drivers of seasonal water level changes in the Great Lakes. Does more ice now mean cooler water temperatures this summer? Ice extent plays a part in determining water temperature in the lakes later in the year, as incoming heat will have to melt the ice before it warms the water below. However, meteorological conditions and heat storage in the lakes are also critical components to the thermal cycle in the lakes. How does blue ice form? Sometimes blue ice develops on the Great Lakes. This is an unusual phenomenon in the Great Lakes that is usually short-lived. Selective absorption by water/ice in the yellow/red part of the spectrum, so the reflected light is blue. Ice can also absorb orange and green light as light energy absorbed by the ice causes the water molecules to vibrate, which can lead to absorption of orange and green light. Ice that is very thick, compressed, and has a lack of bubbles and other inclusions, allows light to penetrate farther thus absorbing more of the longer wavelengths (colors). This leaves shorter wavelength blue light to reflect back or pass through the ice, making the ice look blue. In deep, mid-lake water, where chlorophyll content is low, the reflection of the water can make the ice appear even more blue.